Simply smart. Only available at The Container Store, our exclusive Elfa Component Desk offers a generous work surface for writing, homework, bill paying or computing. A set of Elfa Drawers below provides storage for papers and supplies (the mesh material prevent small items from falling through). Want to design your own Custom Elfa Component Desk? See all of your options at Design Your Own Component Desk. Sand & Platinum Elfa Mesh Component Desk is rated 4.2 out of 5 by 11. Rated 1 out of 5 by JustMe1985 from Need high-power drill for this one Once again, the Container Store makes it seem like anyone can assemble something that requires special power tools. I had to go out and buy a cordless drill for this, and it STILL wasn't powerful enough to get the legs connected to the desktop. I had to ask a handyman to do it -- he luckily had a high-power drill. And it still took some work for him to do it. The legs are put on very sturdily but the mesh drawers are put on with VELCRO. Yes, that's right, you're paying 250.00 for a desk that's half velcro. The drawer stops (which they sell separately and are not cheap) are tiny plastic pieces that keep coming out. So my drawers keep sliding too far back and hitting the wall. Rated 5 out of 5 by DSTAG from Perfect Solution We bought this with four legs and a metal file cabinet to slide underneath for our son's first desk - it's perfect. He loves it, we love it, and the price was right. Rated 5 out of 5 by 4girls1boy from Great desk!! I searched for a very long time to find the perfect desk. This desk is awesome and it looks stylish and expensive. Love it. Rated 4 out of 5 by jjsilv from Great Basic Desk I got this desk for grad school after moving cross country. I love it! Easy to assemble, looks posh and very user friendly. Easily accesible storage and lots of work space. Definitely would recommend it to a friend! Rated 5 out of 5 by Artemis from Art Cart Your Platinum elfa Mesh Drawers on rollers allows me to go from cluttered to clear in five minutes! Because I use my dining table as a work space for my card-making business, I need a storage solution that is sturdy and portable. This cart assembles in minutes and tucks away neatly beside my piano. With my Art Cart, I can channel my inner muse at a moment's notice and still serve dinner on time. Thank you, Container Store! Rated 4 out of 5 by BarbB from Good simple desk. The desk was easy to put together , although you had to read between the lines on the directions. 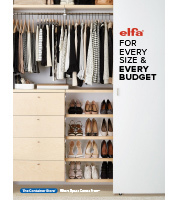 Rated 5 out of 5 by ImContained from Easy to Assemble Elfa is easy to assemble, looks great, and is very functional. I have the white Elfa with the Sycamore top. It's easy to move and reconfigure to meet your current needs. does this desk come with the mesh drawers below? Or do you add on to it with an extra cost? under the 'customize' tab, there are suggested items like a 3 drawer file cabinet. are the cabinets connected and do they fit underneath this desk? The desk comes with the mesh drawers. They ae good sized. We purchased the driftwood desk and was wondering if you only screw the side with the two legs? Won't it move back and forth? You need to purchase the velcro pieces to attach the drawers to the desk top. For some reason they do not include them with the desk. There are online directions that explain how to attach them. Is this epoxy bonded steel magnetic? Yes, the epoxy-bonded steel of our Elfa Components does attract magnets.